I have come to realize I love Fall. Coming from California I don't think I was truly able to appreciate this season. Don't get me wrong we had all the Fall themed decorations and of course pumpkin pie, but my wardrobe was not packed with jackets and scarves. Living in Georgia I began to realize the awesomeness that is Fall especially with tailgates and college football. And let's not forget Fall colors are my colors. I love the cool crisp air of Fall and all the spices and smells that come along with this season. So in honor of Fall and to follow up my baking skills of the apple crisp, I bring you pumpkin oatmeal muffins made from a real pumpkin. I found this recipe on Peanut Butter Fingers blog and they rock (once you double the spices, I love me some all-spice and cinnamon). 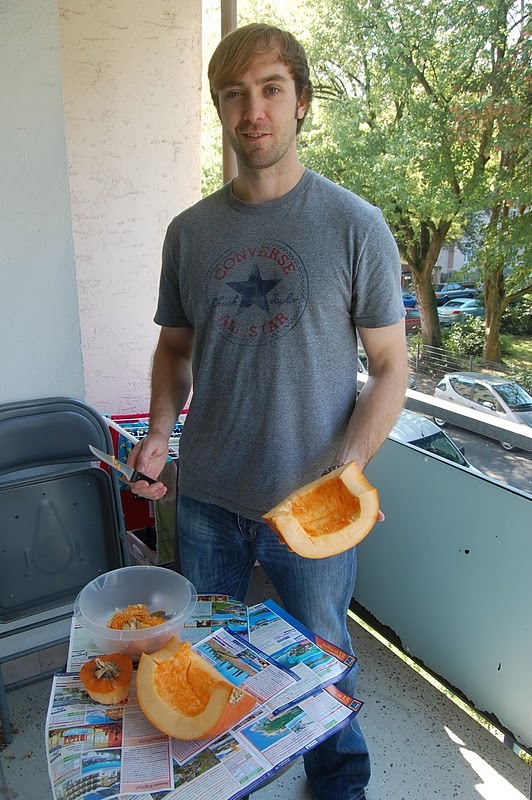 Since canned pumpkin is impossible to find in Germany and I am trying to eat less processed food I decided to use a real pumpkin. This was my first time doing this and I was super excited. After some YouTubbing, I found multiple ways to attack this bad boy. I went with baking, you can also go with steaming or boiling which I will probably do next time because it is a little faster. So let me take you step by step. Next I placed the cleaned out and cut pumpkin on a baking sheet. Yes, I baked these in my toaster oven. In the end I had to cut it into quarters to fit in the toaster oven. I baked two batches for an hour each....I know it was long, but I had a free Saturday afternoon. Next I cleaned off all the seeds and saved them for later toasting. 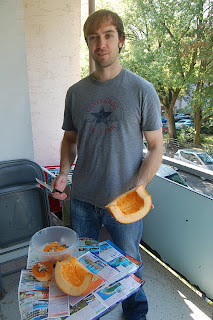 Once the pumpkin was all baked and very soft, I scooped it out and blended it up with a hand mixer. Viola! Fresh pumpkin puree-goodbye canned pumpkin! Now for the pumpkin oatmeal muffins. These are great for breakfast on-the-go or with a little honey or butter. Again I got this recipe here. This was taken a little late in the game, I had already made a batch but you get the idea. Scoop the mixture into the muffin tins. But by my fourth batch and they rocked! Perfect color and perfect texture. Let me give you a little heads up. I bought a medium size pumpkin and made about 90+ muffins. So if you use a real pumpkin buy small or plan to freeze some or make other pumpkin recipes. I picked up my second pumpkin today and my friend and I are going to make pumpkin bread tomorrow! This time I am going to steam it and I will let you know how it goes. If you have any pumpkin recipes (bread, soup, pie, etc.) please share!